Windows Plug and Play technology does a good job of detecting and automatically configuring new hardware. However, if the hardware doesn’t support Plug and Play or it isn’t automatically detected, you need to enter information about the new hardware into the Windows Server 2012 system. You do this by using the Add Hardware Wizard to install the hardware device and its related drivers on the system. You can also use this wizard to troubleshoot problems with existing hardware. If the device has installation media or a downloadable Setup program, run it to copy the driver files to your hard disk. Connect the device to the computer. For internal devices, you must shut down the computer, add the device, and then restart the computer. Open Computer Management, and then select the Device Manager node. Select the computer node in the main pane, and then choose Add Legacy Hardware on the Action menu. In the Add Hardware Wizard, read the introductory message and then tap or click Next. If you choose the search option, the wizard searches for and attempts to automatically detect the new hardware. The process can take several minutes to go through all the device types and options. When the search is complete, any new devices found are displayed, and you can select one. If you choose the manual option, or if no new devices are found in the automatic search, you have to select the hardware type yourself. Select the type of hardware, such as Storage Controllers or Network Adapters, and then tap or click Next. Scroll through the list of manufacturers to find the manufacturer of the device, and then choose the appropriate device in the right pane. Figure 13. Search for or select the new hardware to install. After you complete the selection and installation process, tap or click Next, and then tap or click Next again to confirm that you want to install the hardware. After the wizard installs the drivers for the hardware device, tap or click Finish. The new hardware should now be available. When a device isn’t working properly, sometimes you’ll want to uninstall or disable it. 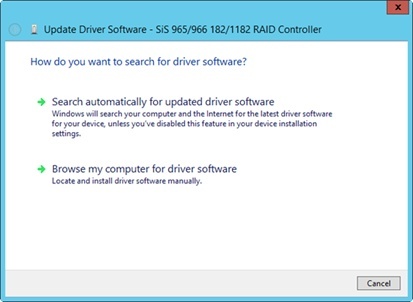 Uninstalling a device removes the driver association for the device so that it temporarily appears that the device has been removed from the system. The next time you restart the system, Windows Server 2012 might try to reinstall the device. Typically, Windows Server 2012 reinstalls Plug and Play devices automatically, but it does not automatically reinstall non–Plug and Play devices. Disabling a device turns it off and prevents Windows Server 2012 from using it. Because a disabled device doesn’t use system resources, you can be sure that it isn’t causing a conflict on the system. Open Computer Management, and then select the Device Manager node. You should now see a complete list of devices installed on the system. By default, this list is organized by device type. Press and hold or right-click the device you want to manage, and then select Enable, Uninstall, or Disable, depending on what you want to do with the device. If prompted to confirm the action, tap or click Yes or OK as appropriate.